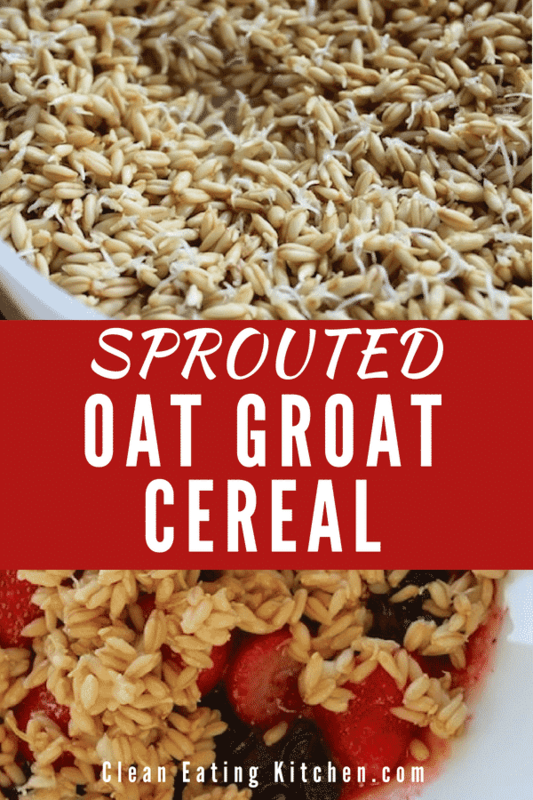 Sprouted oat groats are a delicious and nutritious breakfast. 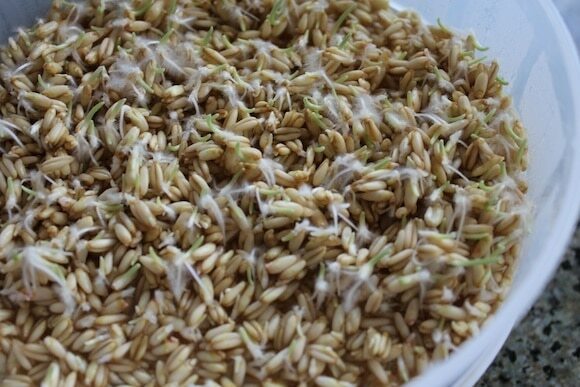 This post shows you how easy it is to sprout oat groats. 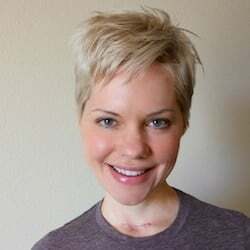 Just to give you some background, neither my husband nor I had any issues digesting grains until the past several years, when I became very gluten-sensitive and then my poor hubby started having some serious digestive issues (apologies if this is T.M.I., but I want to share this info in case it helps you or someone you know). I’m learning that both the problem with mineral absorption and improving the digestibility of grains, nuts, seeds, and legumes is something that can be remedied by taking some extra steps like soaking and even sprouting them, at least some if not all of the time. There are actually some health benefits of consuming phytates as seen in this video from Dr. Greger, so it seems as if it’s a balancing act. Since I am at the beginning of my journey on this topic, I promise to keep writing about it and sharing my experiments. This Sprouted Oat Groat Cereal is the first! I started with gluten-free, raw oat groats. This is what they look like when they’re raw and not sprouted. I soaked the groats in filtered water overnight, rinsed them, and placed them into a sprouter (although not pictured in this tutorial, my current favorite sprouter is the Easy Sprouter. Purchase raw oat groats (gluten-free, if necessary). 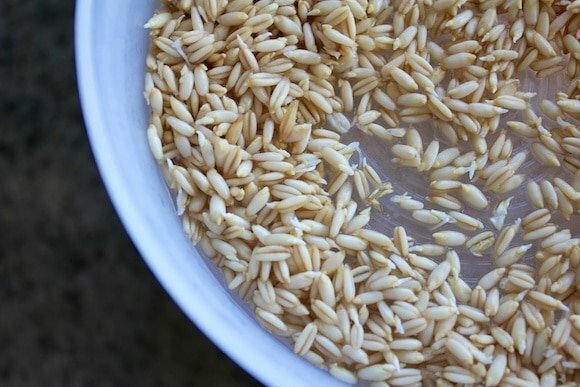 Soak the oat groats in water for 12 hours. Rinse them well. Put the groats in a sprouting device and place in a cool, dark location. 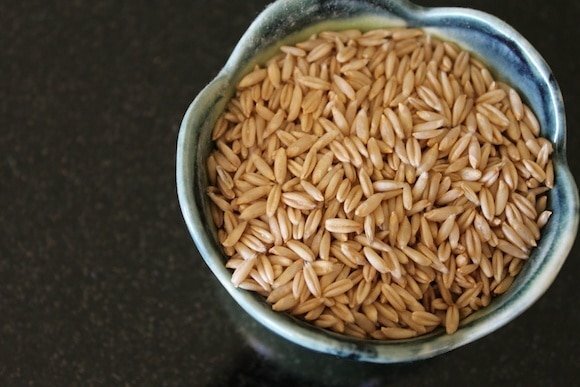 Rinse and drain the oat groats a few times a day with cool, clean water. Once the groats have sprouted, you can move them out of the dark. 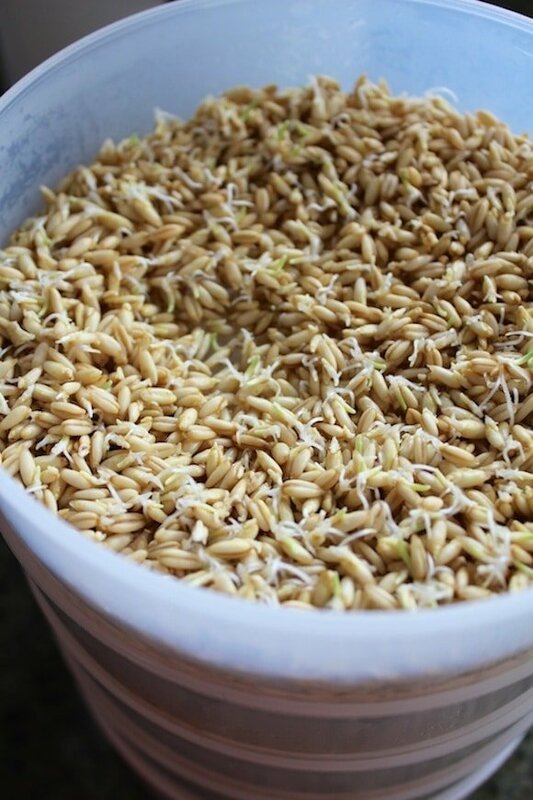 Let the groats sprout until the “tails” are about 1/8″. Give the groats one final rinse and then serve or cook. Here’s what the groats looked like after being soaked 12 hours, rinsed, and and sprouted for one day. 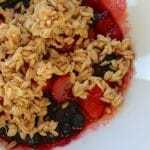 Sprouted Oat Groat Cereal is a delicious and hearty breakfast. 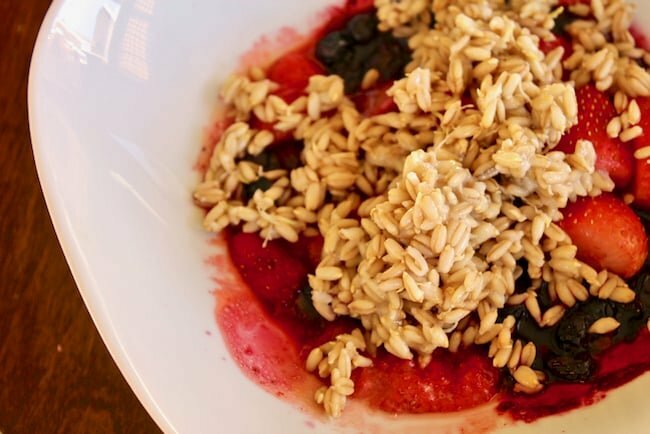 Rinse your raw oat groats and place them in a medium-sized glass bowl or sprouting device. Cover with fresh, filtered water and a pinch of sea salt. Let sit for at least 8 hours or up to 12 hours. 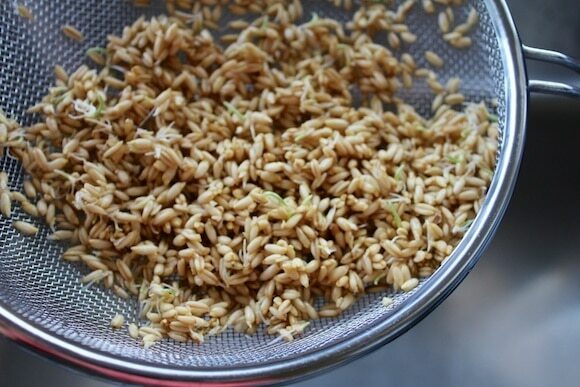 Use a strainer to rinse the oat groats thoroughly. Place the groats in a sprouting device. Rinse 2-3 times a day for at least two days or until the groats have sprouted. Rince the groats one last time and place in a rice cooker or a saucepan. Add one cup of water, raisins, and cook for 15-20 minutes. 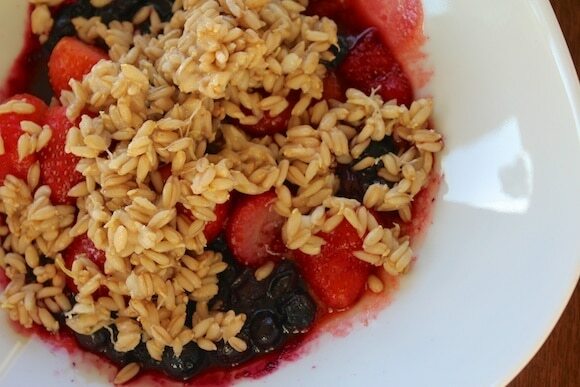 If serving right away, defrost the frozen berries in the microwave and serve with the oat groats. Otherwise, you can store the cooked groats in the fridge for up to 3-5 days or in the freezer. I’d love to hear your input on this topic of soaking and sprouting. Let’s discuss in the comments section. P.S. You might want to check out my Amaranth-Banana Porridge, Winter Breakfast Stew, or Pumpkin Breakfast Brownies. I haven’t had oat groats in a really long time, but I went through a phase a few years back when I loved them. I would soak them overnight, and eat them raw in the morning after rinsing them and then blending them in the food processor. I never sprouted them. Is this an important step? I don’t recall having any problems digesting the raw, soaked, unsprouted groats. Could there be any harm in soaking them and not sprouting them? As someone with GI issues caused by gluten, I am so looking forward to future posts concerning the topic of sprouting. My Dr has mentioned it as well & I did see a sprouting device at my local bulk store but don’t know too much on how to do it let alone have recipes. Keep the gluten free & sprouting topics going as I am in a learning curve myself. Fascinating! and you could presumably make your own oatmeal, too, by rolling the sprouted groats and then dehydrating. Oatmeal cookies again–THAT would be worth the additional effort! Which rice cooker are you using? I have not seen one with “germinated brown rice” setting. Thanks for the recipes and the great information that you share. I’ve learned a lot from your blog. Thanks, Wendy! I didn’t think these were that great, it was kind of a spur-of-the-moment thing, but I am taking baby steps using all the awesome advice you gave me. Xoxo!!! Great question, Marie! Cooking the sprouted grains would greatly diminish the potential for harmful pathogens, but I think you’re right that eating raw sprouts definitely can pose a risk. I heard somewhere (maybe from Dr. Greger?) that growing sprouts at home has less risk than buying them at the store, though. Eating sprouted –anything– provides enzymes to your body’s system. Cooked foods use enzymes to digest it. So sometimes it is good to eat foods that replenish the enzyme base in your system. Sprouts are especially full of enzymes. I love pinhead oats, I soak them overnight and cook them up in the morning. Never tried sprouting them before, but sounds like a good idea, digestion wise. I just made my first batch of groats and oats sprouted. I have just ventured into sprouts and so far, I LOVE THEM! I’m making bean sprouts, lettuce sprouts, and grain sprouts. I’m trying them all 🙂 I’ve read that the nutrition in them is superior to full grown veggies. Thanks for posting this Carrie – I’m very interested in trying this. I’m sensitive to gluten, but seem to have no problem eating things labeled gluten-free (like Bob’s Red Mill gf oats). My hubby has also been having some digestive issues though and I’ve been wracking my brain trying to think of ways to make him easily digestible food. I can’t remember if your man is plant-based or not, Kimmy, but Alan was def having some zinc and magnesium deficiency issues which seem to have been resolved with additional supplementation, plus me going to the effort of soaking and/or sprouting most of our nuts, seeds, and beans. Okay so I am thinking about not cooking the sprout oats. I think I will put the sprouted oat in the Cuisinart and then dry them in thinly spread shapes on a surface and put into the dehydrator. Any words to the wise about this? Thank you, Carrie 🙂 . It’s 2016 and I’m just getting started w/a more vegan diet! I’ve been focusing on grains and beans because fresh organic vegetables aren’t around locally. But only a few grains agree with me, like I grew up with, cooked from dried to a rolling boil. Sprouting and eating raw is becoming my way of eating organic, and veggie so far 🙂 . One of my fav ways to eat oats.